There are many Fuji digital camera accessories available, from the basics like batteries and chargers through to extra perks like HDTV cables and remote releases. This report will give you an overview of the accessories available, the types of camera they’re available for and whether or not they might be useful for your needs. Fuji offers many types of waterproof casings, each fitting one of their Series ranges. One of the best rated is the F80EXR . Most are effective to a depth of 40 meters (about 131 feet), making them ideal for snorkelers or scuba divers looking to capture some underwater shots. Silcone jackets are also available, which wrap around cameras and protect them against dirt and shocks – useful if you shoot a lot of sports events or other outdoors activities, or you plan to take your camera hiking. Fuji also offers a range of soft casings which clip onto your belt. Covers come in a range of colors, so fashion conscious people can match case to camera. 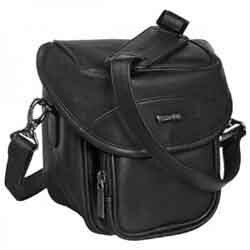 Larger cases with a shoulder strap for Fuji DSLR models are also available. 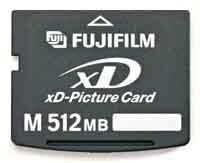 xD Picture Cards are used in the majority of Fujifilm digital cameras due to the fact that they allow for smaller camera designs. xD cards are available in various sizes with 1GB and 2GB capacities being the most popular. There are several different types of memory cards available which are compatible with particular Fuji camera models, so be careful to check out compatibility before you make a purchase. Card adapters that make it easy to transfer footage and images to a computer are also available. The Fujifilm HDP-L1 HD Player and Remote is a device designed to allow you to easily view photos and playback footage from Fuji’s W1 3D camera on your HDTV. Up until the release of this device, the 3D camera has been harshly criticized due to the fact that it was difficult to view and make use of any 3D images you created with it. The HD Player device is a remote device which you simply plug in your SD card to and link up to your TV. There are several models of power adapter available from Fujifilm – as with xD cards, these are each compatible with different camera models. If your adapter has stopped working or you simply want a spare, just opt for the adapter compatible with your same model. Most Fuji digital cameras run on a rechargeable lithium-ion battery. The NP-45 and NP-45A batteries are compatible with the vast majority of digital cameras from Fujifilm. Some cameras take AA rechargeable batteries instead, and typically these can be replaced with disposable, off-the-shelf high power AA batteries if need be. AV cables are also available for hooking some cameras up directly to a television or projector. Battery chargers and DC couplers can also be bought separately. The Fujifilm RR-80 Remote Release is a device you use to take photos from your camera hands-free when it’s at a distance from you. This is handy for taking family photos that you want to appear in or self portraits.